Should we lose, keep, or change the fleur as our logo? Keep the fleur; it's good enough. I'd rather we not use a logo. Change the logo to ____(please post what you'd prefer)___. My opinion is not listed here. I have no preference, regarding the logo. Re: The Fleur de Lis logo: keep, lose, change-to-what? Unfortunately I don't have a scanner and am currently immobile due to the depths of snow (and a rear wheel drive truck), aaaaaand I have no understanding of Pshop, so I would have to paint something, take a picture, and figure out a way to attach the file. I'm not good at technology. Me Caveman. 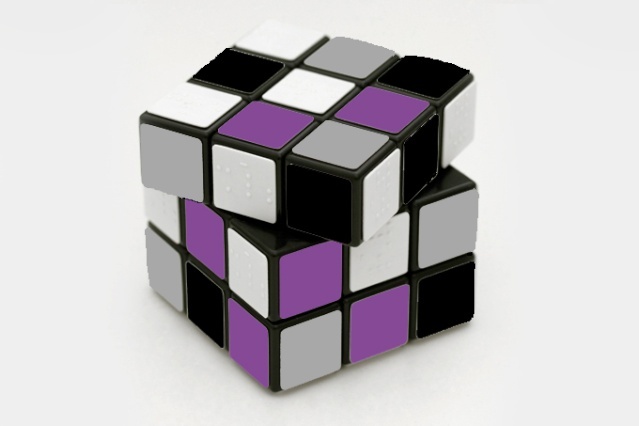 As for the Cube, I'm thinking 3/4 top-down view, with black, gray, purple, and white on the squares. If anyone is a Photoshop wizard, I imagine it would easy to do. It would be difficult doing it by hand. I mean a black Ace of Spades, from a deck of cards, with gray, white, and purple swirling within its boundaries. It's quickly (and badly) done but that's the idea isn't it ? I like the rubik's cube idea as it gets the idea of the possible evolution of things, variety of combinations, and also a kind of complexity. edit : oh and I love the fact that the picture I used is one of a rubik's cube for blind people. By swirl I mean ribbons of gray, black, purple, and white 'swirling' around inside the boundaries of the spade shape, like if you took a paintbrush and 'swirled' the different colors of paint around so that they overlapped and blended in certain areas, but remained separate in others. It's difficult to explain in words. I need to get some purple paint and take a stab at it myself. I look forward to see your painting ! Seems nice. I don't know how to copy and paste your Rubik's cube to AVEN, but I think everyone should see it. If you're a member, could you post the image in the Open Mic forum? You take credit for the work, but credit GrayJim for the idea. Loving the Rubik's Cube conceptually, but we recommend that you guys double check that you aren't stomping on somebody else's copyright, either with the use of a Rubik's Cube image in the first place, or with the use of the specific stock image that you edited in PhotoShop. C&D orders are not our cup of tea. The image isn't made for being a new logo or whatever, it's just used to illustrate what could be done... I didn't remove any copyright written on the picture, which was downloadable so it can't be "copyrighted"... o_O Plus, it's not an art related picture (which would get an author right). It's like taking on internet a picture of a car and editing it to change its color and all, if it's not a personnal image or one of an artist, it doesn't get any copyright, does it ?! The fleur currently doesn't bother me at all. 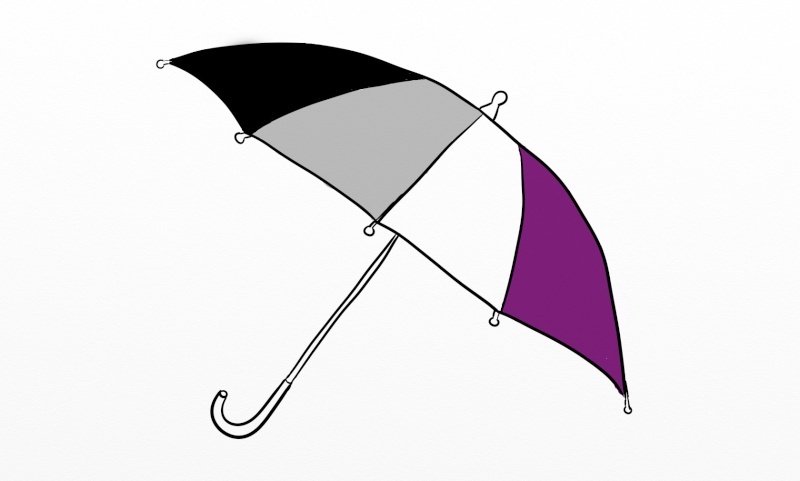 I personally think it's really pretty and as a symbol of either sexuality or chastity (depending on the culture) I feel it already speaks plenty to the general idea that demisexuality deals with requiring an emotional (not necessarily romantic) connection before feelings of sexual atrraction can manifest. If you were to combine 'sexuality' and 'chastity' into a symbol you'd find yourself with a chastity belt, which kind of works the same way xD that sexual attraction/desire is "locked up" and the key to unlock those feelings is a strong emotional bond. While the rubik's cube is a great theoretical concept, it seems to focus too much on the wide range of unique attributes within the community and not enough on the main idea. I mean, it's kind of rhetorical. Halfling wrote: The image isn't made for being a new logo or whatever, it's just used to illustrate what could be done... I didn't remove any copyright written on the picture, which was downloadable so it can't be "copyrighted"... o_O Plus, it's not an art related picture (which would get an author right). It's like taking on internet a picture of a car and editing it to change its color and all, if it's not a personnal image or one of an artist, it doesn't get any copyright, does it ?! Just because something can be downloaded, doesn't mean it isn't copyrighted. I'm not 100% sure about using the image of a Rubik's cube because the item is already iconic of the brand anyway. For example, if your logo contains... a box of tissues, no one would be able to determine (let alone prove) that the box of tissues is speficially Kleenex or Puffs, and thus you won't need to worry about running into legal issues. But because something like a Rubik's is only made by one company and is so iconic of that brand, there is little opportunity to try to put a spin on said icon/logo without it being recognized as a Rubik's cube. = accurate and the main source of concern here over the use of that image base. Ack ran out of time tonight cleaning house before I go out of town for the day tomorrow, but! I did come up with an idea that could even work as logo specific to this forum will update with designs as soon as I can. Patience is greatly appreciated! No worries and no rush. The thread has been around for awhile. For the community's consideration, I came up with this for the forum in specfic. "DG" gave a perfect opportunity I couldn't pass up and came up with this: www.glowstickminuet.tumblr.com/post/78088622296 this is super rough, but I thought if the fleur logo stays, this is a great way to be subtle yet specific for DG. Pardon my excitement xD I design for a living so to at least participate even in a long-existing thread debate for a logo is a lot of fun! Liking the cut of your jib here, 'Wishes. The initials-based one is fantastic as a forum-specific logo, although likely the demi & grey-ace community won't see it as emblematic of the whole bunch. Posting the modified picture here isn't something I'm try to get money from, or anything like that. Do you think a company like Rubik's would come here and claim for compensation.... I guess they've better things to do. But if you're unconfortable to let it posted here, you can put it away, it's your right as an admin here and I really don't care, as far I'm concerned ^^'. Because that is the entire point of this thread, and you depicted the cube image as a potential logo for representing either the forum or the community as a whole. Nobody was upset about you posting the pic; you're misunderstanding the discussion, if that is what you are assuming. We are simply clarifying that, nice image or not, it won't really be viable for use as a forum logo here. Hey, no worries! It happens. Beauty, strength, power, love, life, light. Uncertain origins, unisex, ancient and traditional yet new and classicly stylized. Hotly debated and not totally understood clearly even by those who have studied it's origins. To be honest. It sounds a lot like us. Something like this? I mean, probably more polished, but generally? Yes! I approve of this. And the AVEN triangle DOES have a holocaust vibe to it..